Many people come into contact with Asbestos Containing Products and Materials on a regular basis – millions of Australian homes and buildings contain Asbestos Containing Products, or are built out of Asbestos Containing Materials. Over 97% of asbestos product used in Australia were non-friable asbestos products or material in which the asbestos fibres were bonded by cement, vinyl, resin or other similar material. The majority of bonded asbestos products and materials are safe to be around until they start to deteriorate, are damaged, cut, drilled, sanded or interfered with. When this happens, asbestos fibre/dust is released, and they become dangerous. Asbestos was used in the manufacture of building materials in Australia until the late 1980s, when its use in building materials ceased. But its use and importation was not totally banned in Australia until the end of 2003. It is generally accepted; virtually every building of any description, constructed or renovated prior to 1990 has the possibility of having asbestos containing materials somewhere. However it is possible any building constructed or renovated prior to 2004 may contain products that include asbestos in some form. Remember – there are in excess of 3000 known asbestos containing products! The term Asbestos Cement Building Material is used to describe three main forms of building materials manufactured using asbestos cement compounds. Asbestos Cement Sheet which is often referred to as ‘fibro’ or incorrectly, as just straight ‘asbestos’. It came in various size flat wall sheets or planks (of various finishes). The majority of these materials are generally quite safe, if in situ painted and in good condition. If sealed with paint, they do not leach toxic fibres or fumes. It is only when damaged or worked on wrongly they become dangerous and toxic asbestos fibres may be released. Compressed Asbestos Cement Board, is thicker and stronger than normal asbestos cement sheet. It was commonly used as flooring (particularly in wet areas), on steps, and as decking on patios and verandahs. It can also be found being used as wall cladding where strength is needed, or where there is heavy pedestrian traffic. Asbestos Cement Corrugated Roof, Wall and Fence Sheeting was readily available in a number of profiles. It was mainly used with either a profile similar to today’s corrugated metal roofing, which was typically used for domestic roofing and wall cladding, and in a profile called ‘Super 6’, which had very deep corrugations. ‘Super 6’ was also used domestically for roofing, but was mainly used domestically for fencing and commercially for roofing and wall cladding. As with flat asbestos cement sheeting, if painted on both sides and in good condition it is quite safe unless damaged or sufferers any form of abrasion. Unfortunately the majority of corrugated cement sheeting is not painted and is breaking down rapidly with the cement bonding releasing asbestos fibres every time it rains or the wind blows. This material is considered in the highest category for prioritised removal across Australia. These products are generally not as obvious as the materials discussed above. Some of these include: compressed sheet flooring, flues, waste and water pipes, telecom pits, down pipes, guttering, laundry tubs, toilet systems, shower bases, planter boxes, water meter boxes, water pits, vents, moldings (all types and forms) – again the list is almost endless! As with above, if not painted and in good condition it presents a risk that should be negated. Products specifically used in the building industry that contain asbestos are normally of the bonded nature, where asbestos is used in the production process to give the product increased strength, flexibility or insulating properties. These products can either be be classed as bonded or friable. They can include bonded products such as splash back material, acoustic ceiling tiles, vinyl and ceramic floor tiles, insulation board, carpet underlay, wall and ceiling, vents, cornices and decorative moldings etc; and friable products such as window putty, adhesives, pipe lagging, spray on insulation, etc. Paint is another product that often contained asbestos, particularly in architectural coatings, which were used to give decorative finishes – these often looked like the paint had been troweled on, and gave a swirly effect. Caution: Due to age, deterioration or the very nature of the product, most bonded asbestos containing building products can easily become friable, and should be treated with care if being removed or having maintenance done on them. Vinyl floor tiles containing asbestos, for example, should not have abrasive buffers used on them; similarly asbestos containing acoustic ceiling tiles should not be cleaned using stiff brooms – in some cases if they are not in sound condition, they should not be cleaned at all. Asbestos containing paints and putties should never be sanded. Abrasive products should never be used on any asbestos containing material or product. Asbestos Containing Products are those that contain asbestos, these can include stoves, heaters, hot water services, boilers, air-conditioners and refrigerators with asbestos insulation, electrical switchboards, pipe insulation lagging; asbestos insulation board used in air-conditioning ductwork, on walls etc. and many more. The asbestos used in these products can be classed as either bonded or friable. Concealed areas – external and/or internal wall cavities, etc. Look for things like insulated pipe work that has been run in the cavities between double brick walls and through framework between inner and outer wall cladding, and also for steel structural beams, etc. that have been sprayed with fire retardant. Eaves – cement sheet (often will have visible air vent holes or slots cut in it); insulation board (normally high grade asbestos content) has also been known to be used as soffit or eave lining material; preformed molded air vents, etc. Fire Safety – Walls and doors could contain asbestos insulation board or other asbestos material. Likewise, windows could contain asbestos fire-proofing coatings. Out Buildings – Wall cladding, roofing and doors. Pipes – Drinking; storm water; sullage and sewage; irrigation etc. Walls – Flat sheet and planks (weatherboard replacement); compressed cement (thick) board; corrugated – both round and flat profile; and imitation brick cladding; window and door in-fills; capping; cover strips and insulation board; architectural (textured) paint; preformed molded vents and decorative moldings (generally cement based); etc. Window Areas – Putty, sealants, coatings; etc. Adhesives, putties, sealants etc – Used for securing ceramic and vinyl tiles, sealing windows, pipe work; etc. Fire Safety – Walls and doors could contain fire-proofing asbestos insulation board or other asbestos material; likewise, windows could contain asbestos fire-proofing coatings. 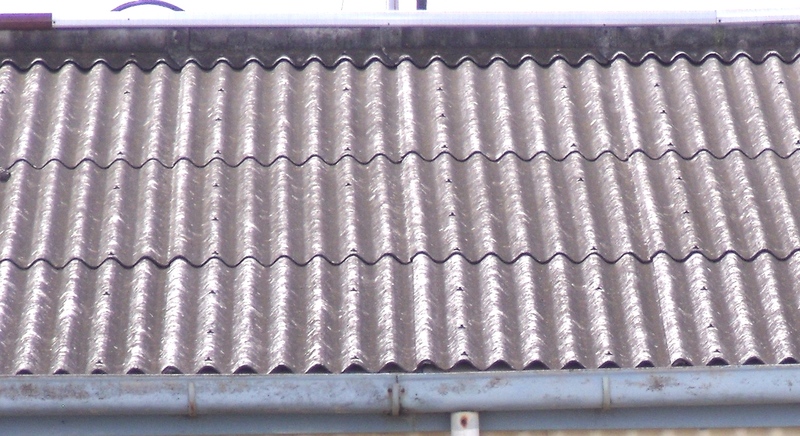 Asbestos cement (thin) flat sheet (commonly known as ‘fibro’) and planks (commonly called ‘Hardie Plank’) used for interior and exterior wall and ceiling cladding and to line eaves. It was also extensively used as waterproof paneling under floor tiles/linoleum and behind wall tiles in wet areas, kitchens, bathroom, laundries and toilets. It was also used as below and above ground level waterproof barrier material. 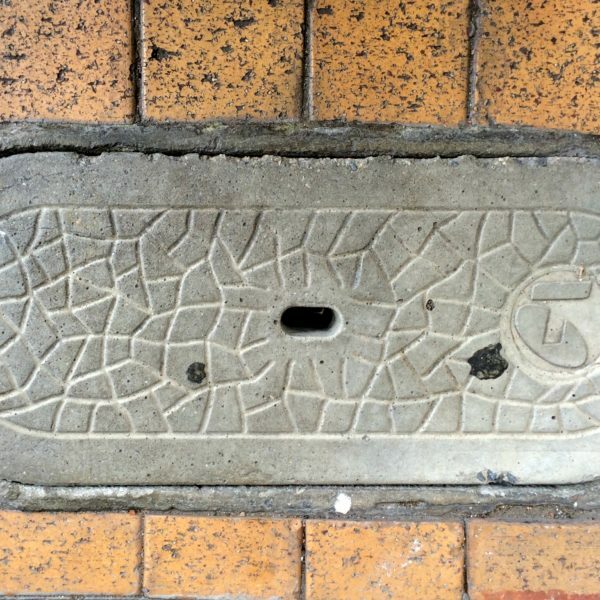 Asbestos cement compressed (known as ‘thick’) sheet commonly used as outdoor walkway material, such as on verandah decks and steps, can also be found in bathrooms and even used to manufacture outside seats. It is very hard, strong, and heavy; and about 2cm thick. Asbestos cement; corrugated roof sheeting; guttering and downpipes; roof ridge; fascia; wall capping; cover stripping; and flat profile corrugated wall cladding. 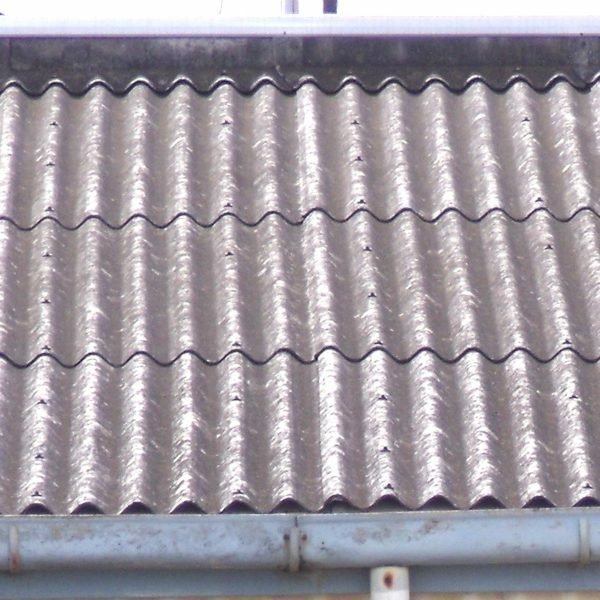 Asbestos cement corrugated material was used as wall cladding and roofing on industrial and commercial type buildings, houses garages, cubby houses, tool sheds, chook houses and as fencing. Asbestos cement flues used on heaters, boiler, stoves etc. These can be found in the house above heater and hot water services; in ceiling cavities; and outside running up walls and above the roof. Asbestos containing floor, wall, and roof tiles; insulation board and ceiling tiles; floor linoleum and imitation brick cladding. Asbestos containing cement drinking water, storm water, sewage and irrigation piping. Coloured waterproof wall cladding with a smooth finish, much like modern day laminex, used as splash backs in kitchen, bathrooms and laundries; and commonly found as decorative wall paneling above baths and in shower cubicles – it was generally screwed on using countersunk screws and washers. Garden products, such as asbestos cement planter boxes etc. 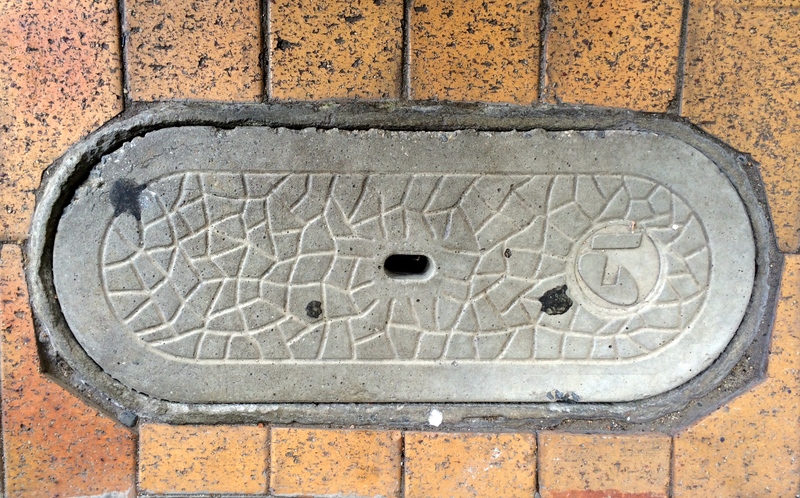 Telecommunication and water meter pits commonly seen outside many homes in the nature strip and in gardens may be made out of Asbestos Cement Material (ACM) – in 2013 Telstra estimated there were in excess of 3 million telecommunication pits made from ACM in Australia! Wall and ceiling (both indoor and outdoor) preformed air vents; cornices and decorative moldings. Friable (loose) asbestos insulation wrapped around gas and hot water pipe work; in and around hot water services; and inside gas, wood and electric stoves. Gaskets in all types of stoves and heaters. Insulation in ceiling spaces – most commonly found in the Canberra and surrounding regions, in houses built before 1980 – known as Mr Fluffy Asbestos Insulation. Asbestos impregnated hessian carpet underlay. Friable and non-friable asbestos in electrical switchboards. – Yes, the list is almost endless!